About ten minutes into Lone Survivor, you’re left absolutely flabbergasted. Not because anything of note happens during this opening other than character introductions and basic exposition; but because there is nothing in the direction, nothing in the way it’s shot, and absolutely bugger all in the writing, pacing and characterisation that shows that this film was directed by the same man who did Battleship. It truly is astonishing that Peter Berg really does know how to craft a film from the beginning onwards and never once render it unwatchable. There’s hardly any CG if at all; the characters actually act like comprehensible human beings and also talk like comprehensible human beings to boot; and the action is extremely intense and highly engaging. 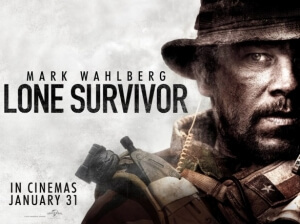 In short, Lone Survivor is an impressive movie. Which begs the question: where the hell was all this when Berg made that notorious studio stinker? According to certain reports, Berg only signed on to direct that movie so he could then go on and make this one, proudly sacrificing any shade of dignity momentarily during the process. Quid pro quo, indeed. But now, back to talking about Lone Survivor. Opening with a montage of real-life Navy SEALs during training exercises, and then closing it out with a four-minute tribute to the fallen soldiers of the real-life failed operation this movie is based on, you wouldn’t be mistaken for thinking it to be mere military propaganda. There are indeed times when the pro-military imagery throughout the film can be too on-the-nose, sometimes uncomfortably so. But the trick is actually in making us care, and in four fine actors – Mark Wahlberg, Taylor Kitsch, Emile Hirsch and Ben Foster – Berg finds the heart a film like this certainly needs. Although Wahlberg is given the lion’s share of powerful moments, and in doing so delivers an incredibly raw performance that’s drenched in realism and emotion, the remaining three actors do a great job at conveying the immediacy of the situation as well as the intense fear they have of their eventual fate. By the way, isn’t it so uplifting to see Taylor Kitsch in a successful film after all he’s been through? But you could argue that the real star is Berg himself. His direction is precise and calculated, particularly in the numerous action scenes this movie surprisingly packs. The middle-point shoot-out between the soldiers and Taliban gunmen is gut-wrenchingly tense, and it is down to Berg’s direction that makes it all thrilling to watch, even if its realistic gore might be too much for some to handle. Special mention must go to the sound editors, who make every single moment of gunfire or surprise explosion catch you off guard. When the soldiers are forced to fall down a large rocky hill at one point, the sound is designed in such a way that really feels like it hurts. They’re some of the most effective uses of sound we’ve heard in a while, and though Oscar will most likely award Gravity in those categories Lone Survivor will remain a harrowing, but extremely engaging, experience. Perhaps the most effective military film since The Hurt Locker, Lone Survivor boasts excellent talent on and off camera with some breath-taking action sequences. Peter Berg’s days of filming Rihanna saying “boom” are long behind him, if this impressive movie is anything to go by.